Francesco Guarino or Guarini (1611-1651 or 1654) was an Italian painter of the Baroque period, active mainly in the mountainous area east of Naples called Irpinia, and in other areas of the Kingdom of Naples, chiefly Campania, Apulia, and Molise. He was born in Sant'Andrea Apostolo, today a frazione of Solofra in the Province of Avellino, Campania, and died in Gravina di Puglia. 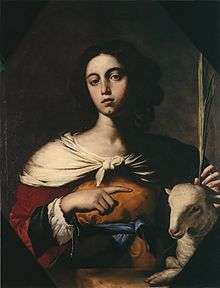 He was a pupil first locally of his father, Giovanni Tommaso Guarino, before moving to Naples to work in the studio of Massimo Stanzione. 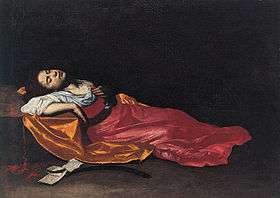 In Naples, like many of his contemporaries there, he was influenced by the style of Caravaggio. In his selection of models who appear to have been plucked from the streets of Naples, he recalls the style of Bernardo Cavallino, the fellow-pupil of Stanzioni. Among his masterpieces are the works for the Collegiata di San Michele Arcangelo in Solofra. Wikimedia Commons has media related to Francesco Guarino.